Hello everyone, and welcome back to The Arcane Sanctum. I hope you all are enjoying your weekend, and are gearing up for the next PPTQ season (which I believe is Standard). Today I wanted to talk about what is perhaps my first love in Modern, and that is Jund. Yes I know this page has many references to WUx control decks, however for most of the last 25 years of me playing this game if I am not on an Azorius deck I am more than likely playing a midrange deck using the shard of Jund as it’s colors. Where are all of you Naya players at by the way? Needless to say Jund is a blast to play, and I’m always happy to see Bloodbraid Elf when I draw a card. Well…that is unless I am at 4 life, and flip it off of Dark Confidant‘s triggered ability. It’s also nice to see many other decks being played thanks to Bloodbraid Elf being legal (yes, even you Gruul Ponza). Let’s take a look at where I am now, and going forward. Jund looks to start off with a discard spell on turn 1, and then play either Dark Confidant, or Tarmogoyf on turn 2. If you’re on the play sometimes you can kill your opponent’s first creature with a Lightning Bolt to also help grow your Tarmogoyf before it’s played. With the large amount of linear aggro decks in the format (such as Humans which just won SCG Minneapolis) having a formidable blocker early is helpful to stay alive a few more turns. Do you like playing cards for free? I do. The Cascade ability on Bloodbraid Elf allows you to cast, for free, the next card with a lower total mana cost than the Elf. It is a “may” ability, meaning you can cast it if you choose. Cascading into a discard spell when your opponent has no cards in hand is an example of where you may not want to cast the card. Thinking about that specific example though you may want to cast it anyway in the event you use a fetchland, and wind up seeing the dead card again. While creatures are important to Jund, so is the removal. Remember when I mentioned that a lot of the format has linear aggro decks? Well you need the removal to deal with it. While some of these cards are singletons in the deck having access to Bloodbraid Elf helps you tutor for it with the Cascade ability. More often than not you’ll also be using a fetchland the turn you cast the elf allowing you to utilize Fatal Push to maximum effect. As far as the sideboard I would not attend a tournament without these 3 in their current numbers above. Not only do we need lifegain from cards like Kitchen Finks, but these three cards in specific are needed against blue based control decks. Liliana, the Last Hope can (acting like a somewhat repeatable Kolaghan’s Command) help bring back Fulminator Mage which is not only good against creature lands, but also good vs Tron. Both the sideboard, and main deck really, are truly flexible. A lot depends on what you are encountering when you play the deck as well as what you may be expecting when going to a larger tournament. Here are some options I have considered but not tested. Dismember might seem strange, but I am looking at cards I can cascade into. This one can help deal with an indestructible creature (or at least one without Hexproof), and in the meta some creatures can get large quickly. Reclamation Sage might seem odd, however with the number of targets this can hit, while also being a 2 power creature, it can have an impact on some board states. While Artifacts are more numerous than Enchantments in the current meta having something that can hit both can be beneficial in the right meta. Porbably the strangest thought of all of these is Bitterblossom. What this card can do in the right meta is provide you a repeatable source of threats, and if it’s removed helps pump your Tarmogoyf. The creatures made from it can threaten other planeswalkers, as well as block large creatures without trample buying you some time. This would probably only be good in matchups where Dark Confidant is bad, and the life loss from it can still add up over time so be careful if you test it. All in all Jund is a lot of fun, and a great deck to play. I know it’s not cheap, and that’s the case with most of Modern right now. If you are able to trade into this deck (hopefully with cards you will never use or regret trading) then have fun. There’s a lot of play to this deck, and a lot of decisions you need to make. 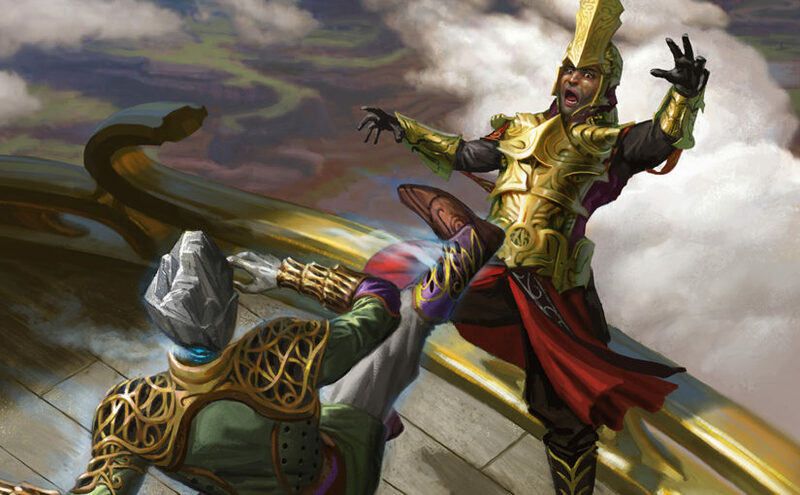 Part of what makes Magic great is the interaction between decks, and not many do that as well as Jund. That’s all for now. Let me know what you think by commenting below, and follow me on both Twitter as well as Facebook.